With a price tag of $9,499 the Kymco UXV 500i TURF offers a lot of value for its money and is one of the most affordable Side by Sides available on today’s market. 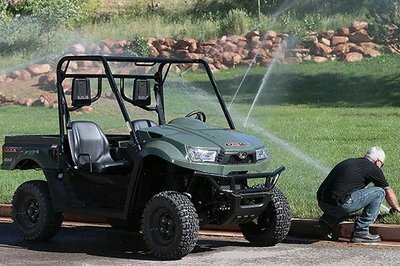 The vehicle was born from Kymco’s desire to design a solid work horse that can be used around the farm or construction site, but can be also used in recreational purposes. Like all UXVs the 500i Turf is comes with a 499 cc, DOHC, 4-Stroke, 4-Valve W/EFI engine that rewards you with a maximum power of 36 hp. As far as performances are concerned, the engine has enough grunt to keep you out of trouble even on tougher terrains, can tow up to 1,200-lb. and is able to propel you to a maximum speed of 45 mph. The Kymco UXV 500i TURF is offered with one year factory warranty. Hit the jump for more information on the 2014 Kymco UXV 500i TURF. 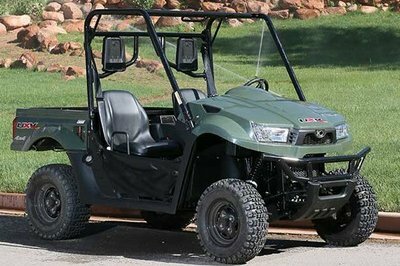 The UXV 500i TURF with new aggressive body style is powered by KYMCO’s dependable DOHC 499cc fuel-injected liquid-cooled 4-stroke 4-valve engine, the UXV TURF IRS 4x4 features push-button on-demand 2WD/4WD, an automatic CVT (H-L-N-R-P) independent dual A-arm suspension with differential lock both fore and aft for easier, lighter turns, perfect for home yard use or commercial landscape applications. 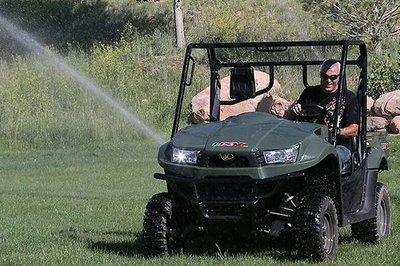 Hydraulic dual-disc front and shaft-mounted hydraulic disc rear brakes and easy on the lawn TURF?tires brings the UXV?TURF?to smooth, light controlled stops on any surface. 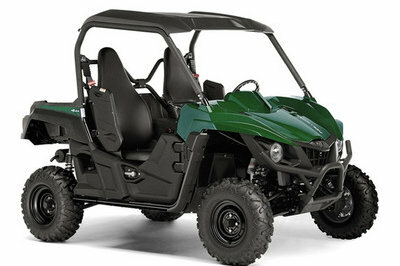 Like all of KYMCO’s UXV models, the 500i TURF comes standard with a 420-lb.-capacity cargo bed, 1,200-lb. towing capacity, 2-inch receiver hitch, locking glove box, underseat and under hood storage, multi-function digital instrument display and 12V accessory outlet. Other amenities include tilting cargo bed and dual beverage holder. Available exclusively in OD Green. • Turf tires for smooth, easy turning that won’t tear up your grass. Claimed Dry Weight 1157 lbs. Rear Cargo Box/Rack Standard Tilting/420 lbs.